BRUS (meaning ¨fizzy¨ in Danish) stands at the corner of an inner street in Nørrebro, Copenhagen. 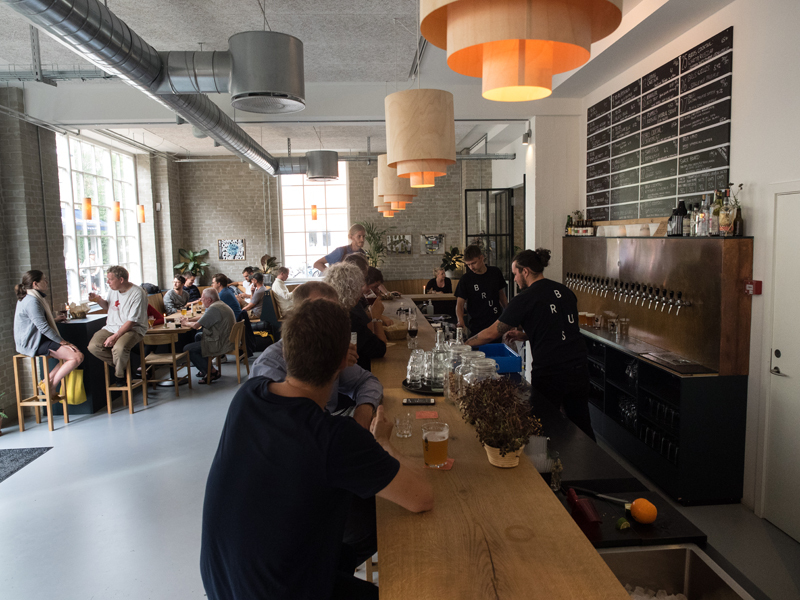 The brewpub, from Danish brewery To Øl, resides in a neighborhood where kebab shops, smoky pubs (what locals call bodegas) and vintage thrift stores stand side-by-side. The entrance of the building (an old locomotive factory) is jampacked with bicycles on a dry August afternoon. Simple wooden folding tables and benches are lined up along its light-gray-brick façade. The seats at BRUS (Guldbergsgade 29F, 1st floor) are filled with young parents with strollers out with friends, enjoying the seemingly rare occasion of sitting outdoors. As you enter the bar, you can’t miss the custom-made half-moon table booths that seamlessly blend with the room’s Scandinavian minimalism. The large windows brighten the seating area, and silver ventilation pipes hang bare on the ceiling. The retro blackboard above the 33 serving taps behind the bar lists the available brews (or beer-cocktails such as White Russian made with porter). A small troop of bartenders is lined up behind the bar counter, dressed in black T-shirts with a white BRUS logo on the back. One of them sings along to Bon Jovi’s “Livin’ on a Prayer” as he pours a sample of beer for a thirsty young woman. The bartender looks on curiously and asks if she would also like to try the new saison. She’ll instead take a large glass of Acid Trip, the red grape edition of a wine-barrel-aged sour ale from Mikkeller. BRUS’ beer is brewed just 25 meters away from the bar counter and is later transferred into six 1,000-liter steel serving tanks that are stacked on top of each other next to the bar counter. BRUS Willis, a recent single-hopped Simcoe pale ale, demonstrates notes of a slightly underripe mandarin, loaded with fresh hops. 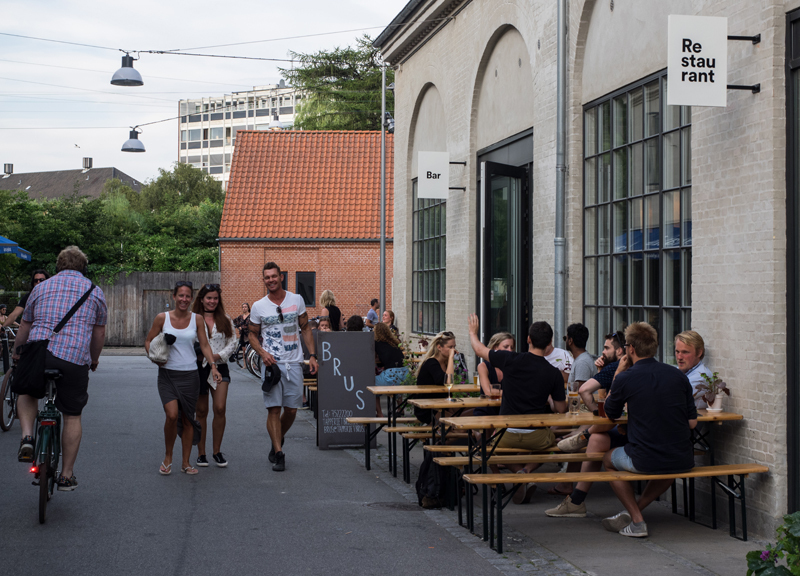 BRUS opened in May 2016, but its roots trace back a decade, when To Øl founders Tore Gynther and Tobias Emil Jensen were in high school (just around the corner from the brewpub). Under the guidance of their chemistry teacher, Mikkel Borg Bjergsø, who later founded the famed microbrewery Mikkeller, Tore and Tobias learned how to brew, using the school’s recently purchased brewing equipment (Denmark’s legal drinking age is 16 for beer). A few years later, their first beer, “Overall,” an imperial IPA, was launched.